The unusual, extended winter weather that we softies here in North Carolina have endured has affected me in an odd way. I am obsessed with hummus. The Middle Eastern chickpea-and-tahini dip. I can’t stop making it. It all started when I received a Magic Bullet for Christmas. The mini-blender machine is not the kind of gadget I’d buy for myself, and while looking for its best uses, I found a recipe for hummus in the accompanying booklet. How easy: Toss some drained canned chickpeas in the machine with tahini, lemon juice, garlic and olive oil. Two days later, the batch was gone. I craved it with my lunch and for afternoon snacks. I had to move beyond the small capacity of the Bullet. My food processor held much more, and the larger bowl made it easier to get the hummus to a smooth consistency. I added a touch of cayenne pepper. The batches lasted three days. I decided to recreate some delicious edamame hummus I had at Raleigh’s Duck & Dumpling. Frozen edamame, cooked in the microwave, made a fine substitute for chickpeas. I tossed in a dash of soy sauce for an Asian touch. The fascinating green color was the talk of potlucks, and it disappeared. What does the nutrition information on recipes and products mean? Not a lot, according to The News & Observer (Raleigh, N.C.) today. The article says that so many judgment calls have to be made that even professionals question their worth. How much marinade does a chicken breast absorb? Short of lab analysis, it’s a guess. The N&O recently eliminated nutritional breakdowns on its recipes. Read more here. Is food at museum cafes a work of art? The Charlotte (N.C.) Observer tells us today. Read more here. The Winston-Salem (N.C.) Journal offers words of cooking wisdom from 87-year-old Miss Kathy, who makes her own wine and owns five heavily used Crock-Pots. Get your dose of inspiration here. There is an alphabet soup of new sweeteners out there, from agave nectar to Xylitol. The San Francisco Chronicle attempts to sort out their benefits and drawbacks here. And as the Winter Olympics begin winding down, the Vancouver Sun seems to be just a touch bitter about Canada’s loss to the US in ice hockey. It offers a selection from – believe it or not – a collection of hockey soup recipes. Find out more here. 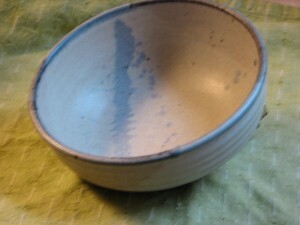 When talking about hunger, the symbolism of the empty bowl is simple and profound. Organizations nationwide are organizing “empty bowls” events to raise money and awareness about hunger. Urban Ministries of Durham will hold Empty Bowls ’10 on March 5, featuring soups from eight area restaurants and bowls created by local potters. Participating restaurants include Blu Seafood & Bar, Urban Ministries’ Community Cafe, Nana’s, Papa Mojo’s Roadhouse, Revolution, Rue Cler, Watts Grocery and Whole Foods Market. For $30, you get to taste great soups and keep the handmade bowl. Tickets are $15 for the soup tasting only. The event will be at the Durham Armory from 5:30 to 8 p.m. To purchase tickets or find out more, visit here. The James Beard Awards semi-finalists were announced today, and there are a number of Triangle chefs and restaurants on the list. The awards recognize excellent chefs and restaurants around the country, and have been called the Oscars of the food world. Four Triangle chefs are semi-finalists for Best Chef-Southeast: Ashley Christensen of Poole’s Diner in Raleigh, N.C., Scott Howell of Nana’s in Durham, Andrea Reusing of Lantern in Chapel Hill and Bill Smith of Crook’s Corner. Beyond the Triangle, Good Food on Montford in Charlotte, N.C. is a semi-finalist for Best New Restaurant. Eric Solomon of European Cellars/Eric Solomon Selections in Charlotte has been nominated for Outstanding Wine and Spirits Professional. Asheville, N.C. chef Jacob Sessoms of Table is also a semi-finalists for Best Chef-Southeast. As best I can remember, this may be the most North Carolina semi-finalists ever in the awards. It shows how the state’s restaurant scene has advanced and drawn national attention. The final nominees will be announced on March 22, and the awards will be presented in New York on May 3. For more information about the James Beard Foundation and the awards, go here. Andrea Weigl in The News & Observer (Raleigh, N.C.) today gives us the news that David Mao, chef and co-owner of The Duck & Dumpling in Raleigh has retired. Mao got into cooking when his family ran restaurants in Vietnam. A Raleigh resident, who had gotten to know Mao and his food while serving in the Army during the Vietnam War, helped Mao to leave the country in the early 1970s. Asian food was still new to Raleigh residents then, so Mao opened a traditional Chinese restaurant, Mandarin House, in Cameron Village. He served moo goo gai pan, egg drop soup and other Americanized Chinese recipes for about 25 years. Then, as Mao told me a few years ago, he decided it was time to cook the kind of food he had always wanted to prepare. The Duck & Dumpling was the delightful result. The column I wrote with more about Mao is here. I’ll be interested to see what the new chef devises, as long as he keeps those dumplings and that great sea bass dish that I have to stop myself from ordering every single time. And I wish Mao every happiness in the next stage of his life. The N&O story is here. The Charlotte (N.C.) Observer has a story on a woman who has built a simple message – cook and eat with your family – into a big business. Learn about it here. There’s a connection between a participant in TLC’s “Ultimate Cake Off” show and the Wilmington, N.C. Azalea Festival. Find out what it is in Liz Biro’s blog at The Wilmington Star, here. I love winter greens, especially kale, and I try to persuade those less fond of the assertively flavored leafys that they aren’t green monsters. The Dallas Morning News has some intriguing recipes using kale as a pesto base. Read about them here. My scores on the Wii ski jump game are impressive, but since I’m not at the Olympics this year, I’ll just eat. The Vancouver Sun offers “Top 25 treats for a foodie in Vancouver,” including a Bulgarian savory pie. Get your gold medal in snarfing by going here. I’ve been socked by a winter cold. The symptoms include snorting water buffalo sounds coming from my nose and a desire to watch the Olympic curling competition (probably because it would induce sleep even through a throbbing headache and complete congestion). One disadvantage of getting a cold now that I’m over 50 is that I can’t tell if I’m running a fever or if it’s just another hot flash. When I was growing up, the choice in the kitchen for a cold cure was tomato soup, not chicken soup. It’s what I always want when I’m sick. Even now, after years of making chicken soup from scratch and enjoying it (matzo balls, too), I need that bowl of canned, condensed red. I’m sure it’s as much for comfort as anything else. We all want to be babied by our mommies when we’re sick, no matter how old and self-reliant we are. And eating what Mom used to feed us brings back a little of that. But most people I know are firmly in the chicken-soup-as-cold-remedy camp. Many are repelled by my need for tomato soup (you don’t mess with people’s childhood memories, I guess). Well, you sip your soup, I’ll sip mine. Guests bring dishes that reflect the host country. The years that the Summer Olympics were in Greece and Italy, thinking of good food was a breeze. This year’s Winter Olympics in Vancouver, British Columbia, which open Friday, is more challenging. What’s Canadian besides maple syrup and Canadian bacon? I assume that those two ingredients will be amply represented on the buffet, so I’ve been looking for alternatives. I found a reference to a Vancouver bar that has created a special drink for the event called the Silver: Clam and tomato juices, chile peppers, horseradish and beef jerky-infused vodka. That drink should get a gold medal for Drink Likely to Create the Most Violent Hangover Ever. I also found a mention of something called Poutine, which seems to resemble chili-cheese fries. Except with beef gravy and cheese curds. Combine that with the Silver and you’re going to do several triple-quads around the porcelain god. Vancouver, like the Pacific Northwest, is salmon country. My party contribution will be some simple appetizers using slices of smoked salmon and cucumbers. No gravy. Do you heart local food? Valentine’s Day is on a Sunday (this Sunday, just in case you haven’t made arrangements for that special food blogger in your life). If you want to leave your evening free for other activities, and do something different, consider the “I Love U Lunch.” Slow Food Triangle, The Abundance Foundation and the economic advocacy group Loom are bringing together a list of local food producers including Celebrity Dairy, Scratch Baking, Carolina Brewery and the General Store Cafe in Pittsboro, N.C. The lunch, which will be held from 1 p.m. to -4 p.m. in the historic Chatham Mills in Pittsboro, N.C., will raise awareness of renovations at the mill and benefit the food co-op there, Chatham Marketplace. Tickets are $10 in advance and $15 at the door (children under 12 are $8), and can be purchased here. Crabtree Valley Mall in Raleigh, N.C. holds “Wine Wednesday” each month to benefit a different charity. This month’s charity is the Lucy Daniels Center, a nonprofit which provides mental health services for children. From 5 p.m. to 7 p.m., five different wines will be available by the glass at the bar at $10 per glass. All of that money goes to the charity. There’ll also be complementary appetizers. And while we’re all in a loving mood, don’t forget that it’s CSA sign-up time – show the love to your favorite farmer. Find a CSA (Community Supported Agriculture) in your part of North Carolina in this list at the Growing Small Farms section of the Chatham County Center of the N.C. Cooperative Extension Service. Thanks to Debbie Roos of the extension service for compiling this excellent resource. Super Bowl Sunday is almost here, so it’s time to get ready for great eating. The Super Bowl has become kind of like Thanksgiving – a time when groups of people get together ostensibly to celebrate an event, but it’s really about the food. Heat the vegetable oil in a large, heavy pot over medium-high heat. Add the chicken and heat, stirring, until lightly browned, 2 to 3 minutes. Add the sausage and cook, stirring, until lightly browned, about 5 minutes. Remove the sausage and chicken from the pot and set aside. Add the onions, celery, green peppers and garlic to the pot. Cook, stirring, until tender but not limp or browned, 5 to 6 minutes. Add a little more oil if needed to prevent sticking. Return the chicken and sausage to the pot. Add the chicken broth, salt, cayenne pepper, hot pepper sauce and Kitchen Bouquet and bring to a boil. Add the rice, stir and return to a boil. When the mixture is boiling, cover, reduce the heat to low and simmer for 10 minutes. Do not lift the lid during this time. At the end of 10 minutes, remove the lid and, using 2 large spoons, quickly turn the rice from top to bottom. Cover, turn off the heat, and let sit for 20 more minutes. Do not lift the lid. At the end of 20 minutes, check to be sure all the liquid has been absorbed; if not, cover and let sit a few more minutes. Andrea Weigl, food editor for The News & Observer (Raleigh, N.C.) has been following the case of a Durham, N.C. bakery which sold products as gluten-free that actually contained gluten. People with gluten allergies got sick; the owner got arrested. Read the latest here. Stuff-in-a-bowl for the Super Bowl is in the Charlotte (N.C.) Observer. From dip to chili, it’s all here. If you’re still uninspired about the menu for your Super Bowl party, take a cue from the location: Miami. A Cuban-style menu is in the Winston-Salem (N.C.) Journal, here. Continuing with our Super Bowl theme here at Moose Musings, I checked out the Indianapolis Star. They’re touting Indiana microbrews today. You can read more here. I understand that some people there dye their malt beverages Colts blue. Be afraid. In the New York Times, they appear to be over the whole Super Bowl thing. The main story is about Vancouver restaurants, tied to the Winter Olympics, which begin Feb. 12. Read all about it here.